The Spools quilt block has been around for a long time. It is created with simple patches -- only the square and half square triangles. This block gives the quiltmaker some practice in two different block styles -- the individual "spools" are sewn as a nine patch. Following that, you take four of the completed "spools" and sew them together as a four patch. 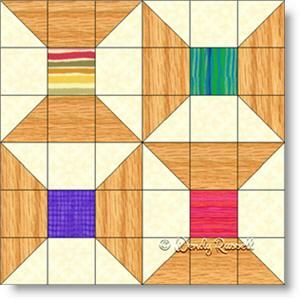 For this block pattern, I chose to use a wood grained fabric, reminiscent of those old wooden spools of times past, and some striped fabrics to be the "thread" on the spools. The two sample quilts illustrated use simple settings -- a side by side layout and an on point layout which continues to utilize many scraps in the extra blank setting triangles.